Our good friend, Ally, who is a designer, did a fantastic job at designing our wedding stationary. I was totally in love with it and think it is definitely is worthy of framing. When we got to discuss the ideas, I really wanted a floral touch with an information card as when I’d attended previous weddings they had used a website which they never updated. A couple of months later she designed the table plan for us, using some of the floral details from the invites. We also got too many invitations printed so using the floral piece at the top, I made the table names. I wanted to use pictures of our family members from their wedding days as a nod to them and make sure they were included. For a DIY element of the wedding, I was really pleased with how they turned out. What do you think? Finally I’ve made a decision! After trailing the internet and local fabric shops, which resulted in finding a lot of uninspiring fabrics, I’m absolutely chuffed with what arrived this evening! Recently I acquired two weaker chairs which are destined for our conservatory. The fabric is very faded but still of high quality, so the plan is to dye these and use new material to make some cushions. Fingers crossed the dying process works but at £5.99 a packet it’s worth a try. This decision was made mainly due to the fact the only fabric I liked was £37.99! Luckily after a quick check on the internet I found it for £25. Understandably, this is ridiculous, but fingers crossed it will be the only expense for the whole room (except paint) and I think it will tie the whole room together. I Just need to find some free time where I can borrow my mum’s sewing machine and have a go at putting into practise all that I learnt on a recent sewing day. Can’t wait to get started! 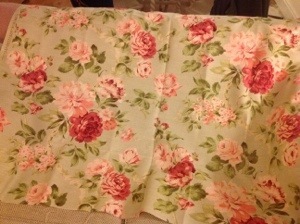 Here is the beautiful fabric; it’s a Blendworth fabric.